Are you prepared for some old school arcade action? Get ready to take control of a robot desperately defending the world from inevitable destruction from the Unidentified Falling Orbs! The robot is our only hope and since it was built hastily to combat the UFO menace it can only fire its laser diagonally. 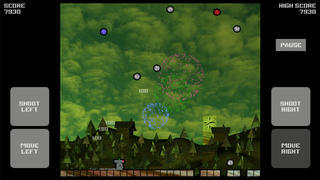 Try to survive and shoot the different UFOs before they destroy the ground! How many points can you rack up before the world is doomed by the UFO menace? • Game Center leader board support! See how well you rank among your friends! • Game Center achievement support! There are 18 achievements to unlock! 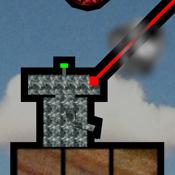 • Background elements and UFOs are randomized every time you play! • A working clock that appears in the background! • The song "Disco con Tutti" by Kevin MacLeod (incompetech.com)!